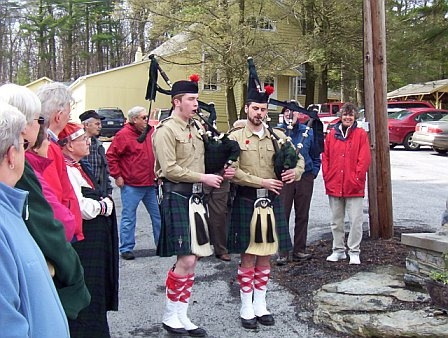 On April 5th, 2008, ceremonies were held near Mary's original home in the Buchanan Valley (near Gettysburg PA) commemorating the 250th anniversary of Mary's capture during the French and Indian Wars. Tom Breslin and his wife, Lucy, attended the ceremonies. Here are Tom's photographs and summary of the day. 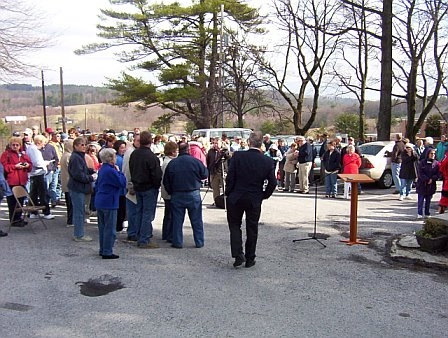 On April 5th 2008 the Biglerville Historical & Preservation Society of Biglerville Pa conducted a public celebration to bring attention to the life of Mary Jemison and how her story related to early life in the Buchanan Valley of Pennsylvania.. Mary's family lived on a farm in that area in 1758 when a raiding party of French and Shawnee Indians attacked them. 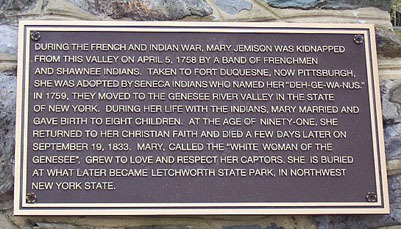 The farm was about 12 miles west of Gettysburg and the result was the amazing life story of Mary Jemison, "The White Woman of the Genesee"
Mary Jemison was memorialized in that valley by the erection of a statue that depicts her as a 15 year old girl. 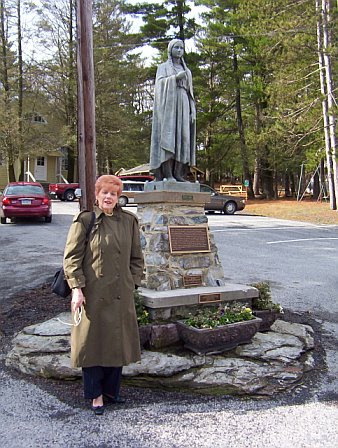 The statue was done by a Catholic Priest named Father Whalen in 1932 and stands on the grounds of St Ignatius Loyola Catholic Church. 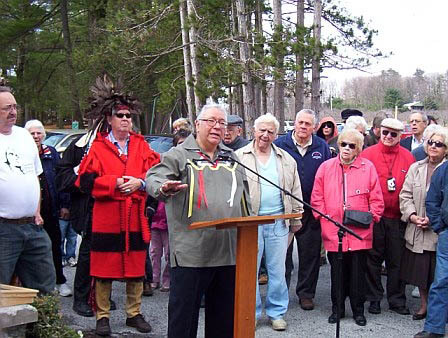 A New York contingent began the days events at the statue with speeches by Peter Jemison from Ganandagan Historic site near Victor, Allan Jamieson of Buffalo and Allan Jamieson Junior describing Mary's importance to the Seneca nation. 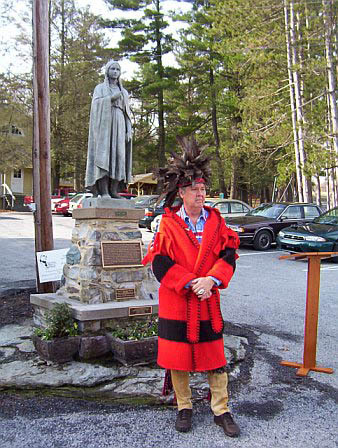 In the afternoon Letchworth Park was represented by Brian Scriven Historic site manager and Roland Beck, Park Manager who teamed up on an illustrated talk about Mary's association with the park. Additional historical commentary was added by Ted Bartlett, Architect for Stearns and Foster of Syracuse. John Thomas also spoke. 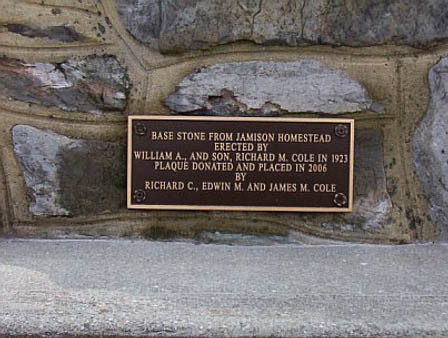 Pioneer life in the area was described by Tim Smith and John Bechtel of the Adams County Pennsylvania Historical Society. Their talks gave details on the families in that area during the middle 1700's and other raids that resulted in captives being taken. Other speakers at the event. 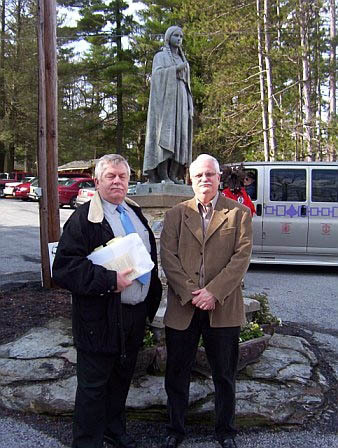 Above: Allan Jamieson, descendant; Right: Ted Bartlett, well known historical speaker, and Brian Scriven,Historic Site Director at Letchworth Park. At the nearby Buchanan Valley Fire Company hall there were exhibitors of crafts and souvenir items, plus demonstrations of Native American dances by a team from the Seneca Nation. A food concession was operated by the Fire Company. The activity was supported by many civic organizations in the area. 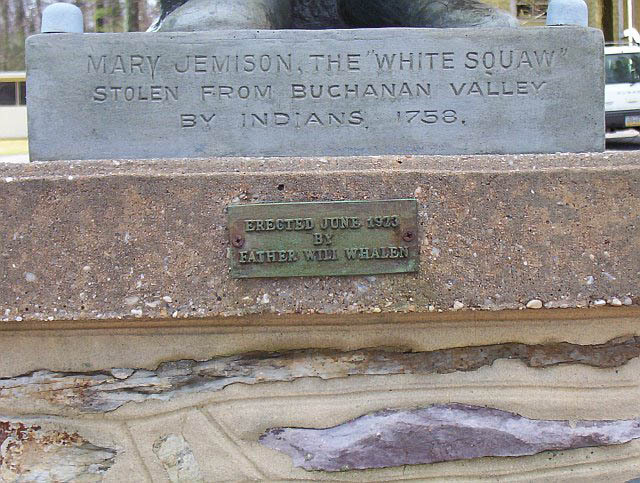 Left: Original inscriptions on the Mary Jemison statue; Above: Recently added plaque with historical details; below left, Plaque recognizing origins of stones for the base of the statue; Below: bagpipers who participated in ceremonies to honor Mary's Scotch-Irish ancestry. 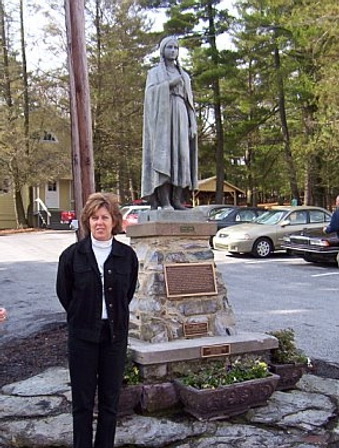 Those who enjoy learning about Mary Jemison are encouraged to visit BOTH statues that have been erected in her honor - the one at St. Ignatius Loyola Catholic Church and, of course, the one in Letchworth Park. Click here to go to the website for the event. For more information, see our Glimpse of Mary Jemison, and other material on her life found in the Mary Jemison section our "Pieces of the Past."